I spent many an hour at Bell's during the summers of the 60's. I had no idea that Crystal City had such a fine amusement park. There is no trace of it now. Just a bedraggled shopping center with that name. My parents bought an old cigar cabinet from the Lakeview amusement park that closed in early 70's. It contained several old 3 x 4 posters dating back to the 40's. I suspect they're from the original Crystal City Park. I aquired two from my mom's estate. I just got them framed at ziegler and they're hung in our game room. Tina, you should post photos of the posters. I'm sure everyone would love to see them. 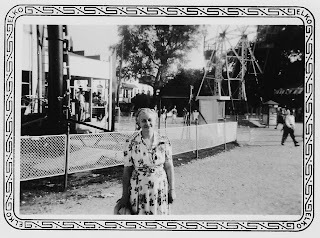 Where exactly was the Crystal City Amusement Park located? Was is where the shopping center is now? Yes, that is the area where it used to be. The picture that is captioned as an "Airplane view at Crystal City" has a ride in the foreground that is a predecessor ride to the "Himalaya" ride once found at Bell's Amusement Park on the fairgrounds. The track elevations are similar to a "Himalaya", only there is no "tarp" or mirror ball in the middle over the "sweeps" and of course no scenery around the outside of it; or a roof. Very interesting picture. This park was built 50 years ago, some areas need to be restructure and beautify. These old roller coasters look awesome to ride. I wish someone can fix them so I can ride at least one of them. "Perth Airport," there are still many old, wonderful roller coasters around the country. I've ridden most of the wood coasters in the U.S. I'm a coaster enthusiast who finds incredible amounts of interest in this Crystal City coaster, Zingo, which Bell's Zingo was named in honor of. Crystal City's Zingo, I can tell by the picture, was either a Philadelphia Toboggan Company or Prior & Church coaster because of the twisting, swoop drop and fan turn. This is utterly amazing, because in a coaster club of many thousands there is very little info on this Zingo, nor any known photos. This is like opening a treasure chest for me tonight. I also am craving good photos of the Jenks park "Skyline Park" later named "Indian Nations." They had a terrain/gulley coaster that I walked the remains of in 1981. It was named "Sky King" and the name was switched to "Phantastic Coaster" in it's last year or two of operation. This was a big, albeit rather tame creation of the National Amusement Device Corporation, and very, very little is known of this coaster's history nor are there many known photos of the coaster in operation. I will pay much for any photos of the Sky King/Phantastic Coaster from anyone who has or knows where I can get any! 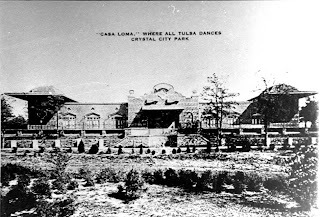 I am familiar with the few excellent pictures on a Tulsa history page I forgt the name of, but if you've been to this site you know what I'm talking about. Oh, I menat to add that half of the Skyline/Indian Nations coaster, the Shy King/Phantastic Coaster was washed away in a 1974 flood. I have over a dozen photos I took of this coaster as it stood, half gone, in 1981 when I visited the then long-closed park & walked the coaster with a few others. Info on photos of this forgotten coaster? email me PLEASE! The old Sea Dragon at Wyandot Lake was one of my favorites. It was at Roseland Park in New York. The place still looks very compelling. I would love to visit this park. I want to experience a new world of excitement. I'm sure that the operators of this park did their best in beautifying and maintaining the equipment for the safety of the guests. Hi anonymous from Dec. 31, 2011. I just read your post about the old photo of the Zingo coaster at Crystal City in Tulsa. I wanted to tell you some things about that ride. It was built in 1928 and was designed and built by Harry Baker. It was one of Baker's Cyclone model of coasters. It is quite similar in ways to a Fred Church Bobs model coaster. Several years ago I was able to acquire the original, and only known surviving, blueprint for a Baker Cyclone. It was hand drawn by Baker on linen cloth paper. It was drafted in April of 1928 for a park in Newburgh, New York, but was never built due to financial problems. I am constructing an HO scale model of this coaster and it looks very similar to Zingo (they are both Cyclone models). It is an incredibly severe design, much like the Traver, Prior & Church coasters of that age. Thanks for posting comments on Zingo. My grandfather used to drive the train at Crystal City. In fact that is him in your picture! Sure would like a copy of that picture! Dear 'Anonymous' of November 9, 2012 at 12:48 PM - Could you (oh would you please please please) post photos of the plan or samples of the plan text? When I was a young boy around1960 my parents took us to Skyline Park. At the time I thought it was called "Fun Spot". Does anyone know anything about "Fun Spot"? -Where did the original Zingo coaster (from CC) end up? -Does anyone know anything about Leon Russell stepping in at one point to purchase the rides from these amusement parks with the intention of rebuilding--either in Oklahoma or somewhere else? Again, would love to hear from anyone with information! Feel free to email me at Meganbenjerry@gmail.com if so! Well done! Nice post! This really helps me to find the answers to my question. School in 1964 and our class rented the park for one day. It had rides, swimming and even horseback riding. What a fun day. Trips to Bell's were the highlight of visits to my grandparents' house in the late 1960s and early 1970s. My grandfather, who nicknamed the place "Hell's Bell's" for some reason, took me for what was likely my last visit to Bell's in about 1974. I was dying to go on the Tilt-A-Whirl and, for some reason, he decided to ride with me. We both hated the Tilt-A-Whirl, but I'll always appreciate his going along for the ride. I still hate whirly rides to this day! How interesting, I have never even heard of this before, love the pics that you posted! I do remember Bell's we had our 8th grade school trip there and it was the first time I had ever been there.